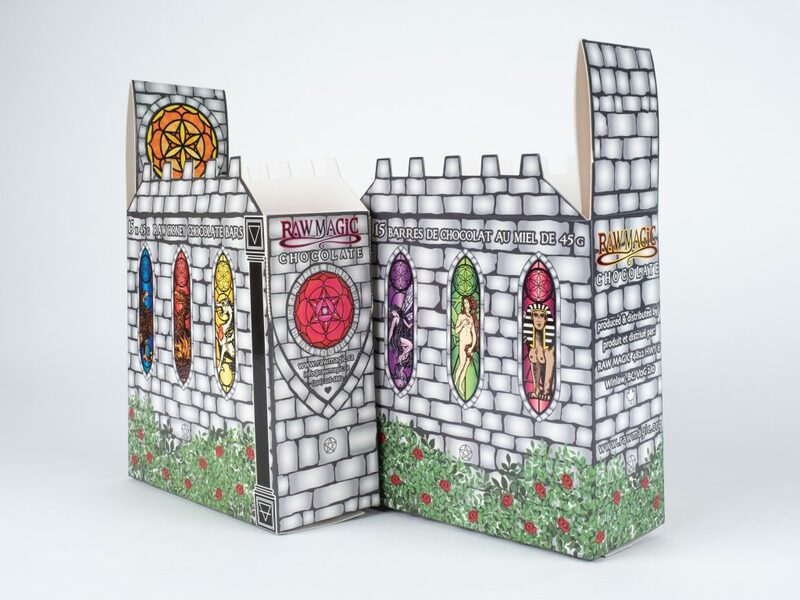 The idea for a “temple box” was inspired by their desire to have a retail shelf display box that portrayed the way they feel about their chocolate. Their custom-built certified food manufacturing facility, also known as their “Temple-Kitchen”, is where they make all of their chocolates. They feel that, when eating their chocolates, it is a way of communion with the “Holy Temple” of our bodies. They knew they had a great product, but it just wasn’t getting the attention it deserved on the retailers’ shelf. 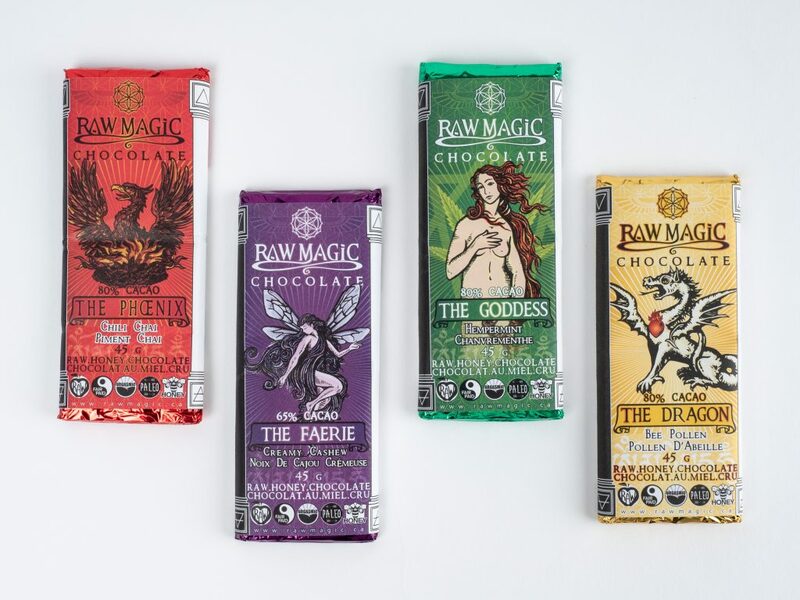 They wanted to be able to tell people in an instant, just how MAGICAL their intentionally-made, super-nutritious chocolate, really was. It was decided that a redesign was necessary for their packaging to make the chocolate bars stand-out on the shelves. One of PakFactory’s packaging specialist instantly knew what was required and coordinated with Raw Magic to put together the structural design for the packaging. PakFactory was always easy to work with; they were (and continue to be) accessible, professional, creative and helpful. We loved our first prototype and had our full first order delivered promptly. Dragon (Andrew Da Silva) designed the details “brick-by-brick” on Illustrator, as he does for all of their branding logos & packaging graphics, and needed a packaging agency that would custom make these works of Art to his standards. Raw Magic needed to work closely with PakFactory to figure out how to make the scores and cuts correctly, and the right paper-weight for easy assembly both by Raw Magic, our retailers converting them to display boxes, and then the customers accessing the contents easily and repeatedly without damaging the boxes. The final specifications resulted in a custom structural dieline made by PakFactory’s design team to create the castle/dark tones of the brand to match the artwork. The packaging functions in two ways: As a display for trade shows & retail as well as a box to store all of the chocolate products. 24 PT Paperboard material was used and also coated with Gloss Lamination and printed on Offset. This combination elevated the artwork perfectly! Since the re-branding, the business has continued to double in sales every year. They are now more vibrant, colourful, beautiful, and also vertical, making it compact for retail space. 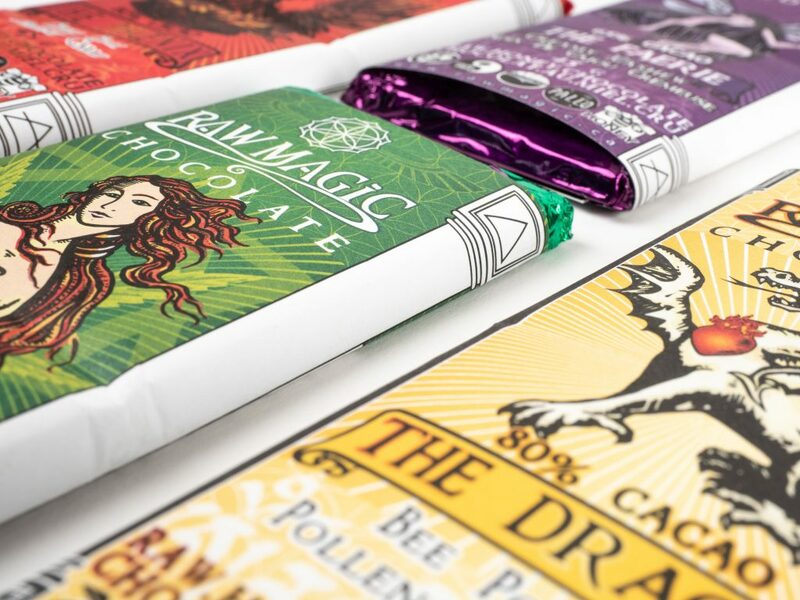 More and more retailers are reaching out and the packaging is starting to acquire an iconic branding making them as the chocolate company with the “castle boxes” in their community.